On October 29, 2015, at 23-weeks pregnant we went in for the normal anatomy check. This appointment was a little different as our ultrasound technician was less chatty and friendly than in previous appointments. At first we did not think much of it, but then she excused herself to review the images with the doctor. As the minutes passed we got more and more uncomfortable and nervous. Forty-five minutes passed before the doctor came in to speak with us. She told us that they discovered that Logan’s stomach was not in his abdomen where it was supposed to be, but was in his chest crowding his lungs. She told us that this was likely caused by something called congenital diaphragmatic hernia (CDH). Our hearts sunk and a million questions started flooding our minds. What is CDH? How did he develop it? Was it something we did? Will he survive? Will he be normal? Our doctor tried her best to answer our questions. She mentioned that she had limited experience with CDH babies and only knew of a few that had survived. As the severity of our son’s condition started to sink in, everything started to blur. Words like "termination," "in utero surgery," "additional birth defects," and "travel for delivery and care" were the only things to really stand out. We left the doctor’s office completely hopeless. We tried not to google CDH, but our curiosity and lack of information we received at our appointment took over. What we found online was devastating. At this point, we were trying to come to grips with the fact that our son would probably not survive. After more visits and even more bad news, we decided we needed a second opinion. This is where Dr. Kays came into play. We found Dr. Kays’ email address, and we sent him an email with the hope of hearing better news about our son’s condition. To our surprise, we received an email back from him in less than 24 hours! After a few email exchanges and a phone call, we decided to travel to St. Petersburg, Florida to have a consultation with Dr. Kays. Afterwards, we knew we had no choice but to make the temporary move from Atlanta, Georgia to St. Petersburg so our son could be under Dr. Kays care. Fast-forward to 38 weeks, 4 days and Logan Jackson was born on February 23 2016 at 4:04 pm weighing 6 lbs. 13 oz. Logan was a much sicker baby than we had originally thought. Logan had his stomach, bowel, spleen, intestines, and 20% of his liver in his chest, crowding his lungs and shifting his heart. His blood gasses were very bad and Logan scored a 2 on the Apgar scale. Logan had his repair surgery at 16 hours old and was placed on ECMO not even 4 hours after that. During surgery it was discovered that Logan only had 15% total lung volume! 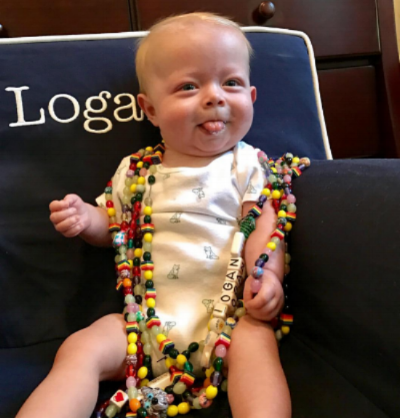 Unfortunately, Logan gave Dr. Kays and his nurses quite a few challenges during his time at Johns Hopkins All Children’s Hospital. In his 81 day hospital stay Logan spent 21 days on ECMO (VV because his veins were too small to get him on VA originally and then VA when VV was no longer helping him), had a chest tube placed, had to be weaned off of ECMO in an emergency at 2 am, had 56 blood transfusions, was intubated for 37 days, had a Nissen fundoplication, and G-tube inserted. Logan was discharged from Johns Hopkins All Children's Hospital after 81 days and made the drive home to Atlanta the following weekend. From discharge to his second birthday Logan has had a total of 14 procedures and surgeries - including his repair surgery, ECMO, inguinal hernias, and most recently a stent placed to fix his occluded SVC. He has been weaned off oxygen since before his first birthday and no longer has his G-tube. Logan is now three and is thriving. He still struggles a little with asthma but has battled colds, the flu and even pneumonia like a champ. We are forever thankful for Dr. Kays using gentle ventilation on Logan so he is able to battle being sick at home and not at the hospital. Logan also struggles a little with his speech. He has been diagnosed with suspected Childhood Apraxia of Speech and he attends therapy 3 days a week. This however does not stop Logan from communicating with us - he has found very funny and unique ways of getting his wants and needs across. We recently welcomed our second child into the world January of 2019. And as you can imagine, having a child after CDH is filled with a lot of emotions and anxiety. We were seen by the high risk doctor for several weeks until they could confirm that she did not have CDH. 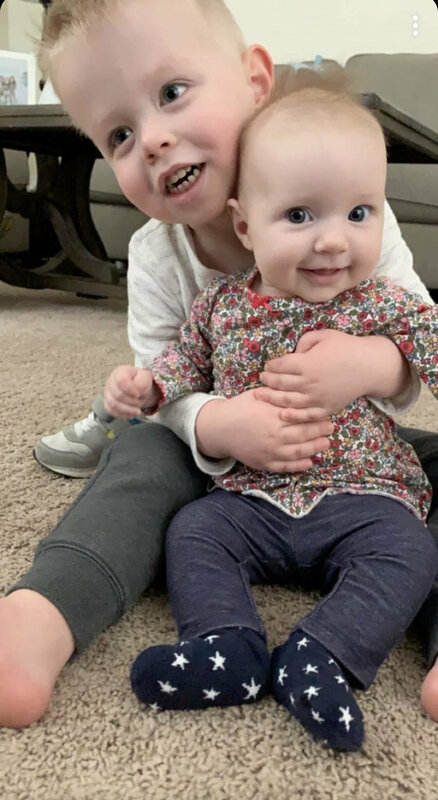 Quinn Isla was born a very happy and healthy baby and has provided our family with the healing we needed after such a traumatic CDH experience. If you want to learn more, you can visit his Facebook page - Love for Logan Desenberg - or email us at fdesenberg@gmail.com.